Located in Morley, Derbyshire, close to the Peak District National Park sits Breadsall Priory. 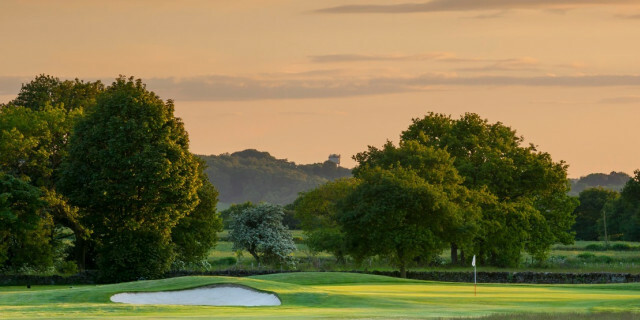 Standing in over 400 acres of parkland this Marriott Hotel and Country Club offers 36 holes of golf in beautiful surroundings and one of only 30 resorts in England offering accommodation and 36 holes. Designed in 1991 by Donald Steel, featuring excellent views of the local countryside The Moorland Course offers a heath-land style layout. 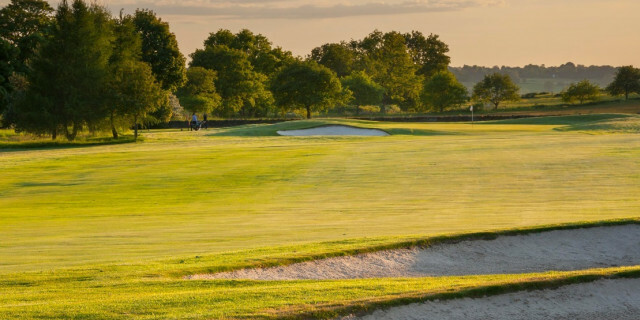 A Par 70 course and measuring just over 6,000 yards off the white tees offers a very playable course where distance isn’t demanded from the golfer. Despite not being “The Championship” course at Breadsall, I was still excited to see what The Moorland would offer. Being guests of Breadsall and joined by PGA Professional Luke Speed helped added to the excitement. Being a Marriott Hotel, the guest assumes a high standard of condition and service. The welcome to the hotel was warm, and coffee was served in the bar adjacent to reception. 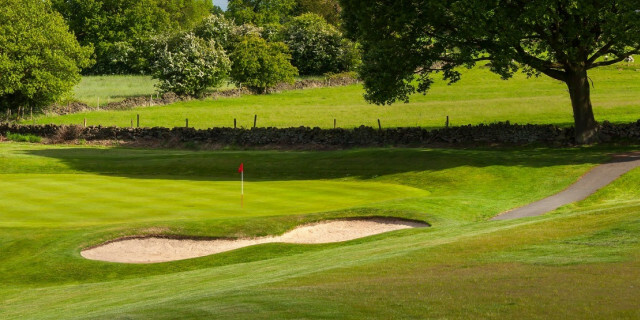 I had heard that the course was solid in its own way and of good condition all year round. Visiting in September 2018 the weather was surprisingly warm, but the course was missing the traditional heather rough/definition. Due to an exceptionally tough summer the decision was made to cut back this visual and challenging feature to ensure pace of play was maintained, allowing guests and members to enjoy the course regardless of external factors. Practice facilities are all presented to a really high standard. A large putting green sits behind the 1st tee on the Priory Course, with a covered driving range adjacent to the 1st hole on the Moorland. Great facilities, including a chipping green with bunkers, all available and all within close proximity, a huge plus at any resort. The Moorland course starts with (something most golfers hate!) 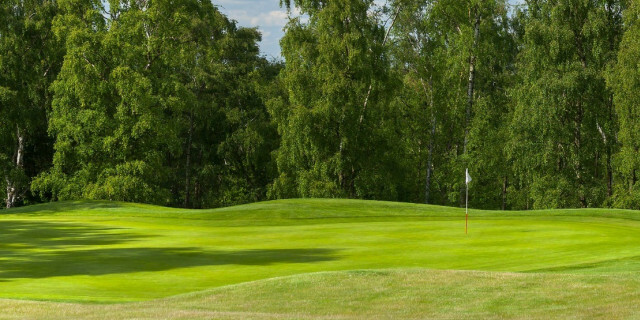 a Par 3, measuring 178 yards off the whites, a tough start to any golf course, needing a mid to long iron with a two tier green surrounded by a tree and bunker on the right. 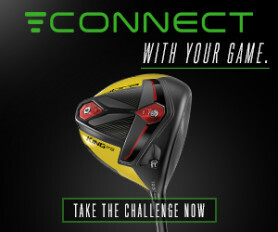 Immediately, the golfer is challenged with stroke index 2 and a very strong Par 4. Measuring 452 yards, slightly uphill (and on the day into wind) giving a real challenge early on in the round. A fairway bunker sits on the right side waiting for anything right and with trees on the left; the 2nd hole is one of the tougher on the course. The next run of holes allows the golfer to recover from a tough start with a run of short holes, primarily because the club of choice for the approach is a short iron or wedge (or off the tee on the lovely par 3 – 6th hole). Plenty of birdie chances to be had until the front 9 finishes as it started with two challenging holes. The 8th hole is a 440 yard Par 4 and the 9th hole is an uphill Par 5, with a tree right in the middle of your approach and totally blind as well, anything right is in danger of being blocked out by one of the many walls which is a feature at Breadsall. The back nine starts with the chance to attack. A short par 4 which although blind form the tee, allows the golfer to get onto or close to the green. Beware of the tree to the right which can block out a chip approach, similar to the 7th, a bunker on the right side will happily gobble up anything short and right. The back nine really gets going with on the 12th – a 400+ yard Par 4 slightly moves left to right with a huge tree on the right side of the fairway. The hole narrows towards the green, where anything left will fall away down the slope leaving a tough chip back up to the green. On to the 13th hole (Par 4 measuring 436 yards) which is by far the tightest driving hole on the course, but the golfer can bail out right on the adjacent 12th if needed! Stroke index 1 for a reason, this hole would not look out of place at Woburn, with a long approach required; par is a great score here. Arguably, the 14th is the signature hole, a lovely Par 3 at 145 yards, from an elevated tee with bunkers right and left to catch any shots which are mis-hit or mis-clubbed. The green slopes heavily from back to front, but also right to left. Now you head back towards the club house on the 16th with a short Par 5, measuring only 475 yards this is a great opportunity to get a shot back. Driver down the right side can hit a slope and pump the ball even further down the fairway. The 18th hole - a good finishing hole. A relatively short Par 4 with an elevated tee. The fairway sweeps right to left with OB and trees on the left, two bunkers at 240 yards on the right. 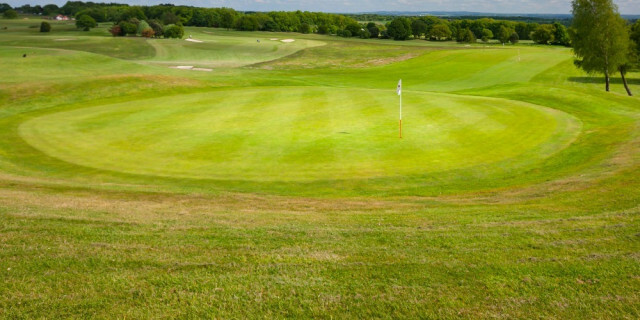 The green is large and undulating but if you’ve successfully negotiated the tee shot a short approach will follow. The course offers the golfer good opportunities to attack if they so wish. On the front 9 alone you have three short Par 4 holes which you can attempt to drive or get close to from the tee, these are very much risk and reward though. The 3rd hole is well protected by deep bunkers and a raised green. 4th hole allows the golfer to cut the corner from a beautifully elevated tee (from which the views are stunning) and the 7th and 10th although blind off the tee with the right line can have a crack if your short game is up to the recovery shot if the green is missed! Also, the Par 3s offers a great variety with different distances and elevation changes and both the 6th and 14th played from above the green. This course is very playable, only a few holes are what you would describe as “long” and both Par 5s are reachable in two, if a successful tee shot has been achieved. Having to cut back the rough due to the summer conditions, I do feel the course was playing a touch easier than normal with some of the normal defence removed. Having said that the course was in great shape (Sept 2018) with the fairways, greens all to a very good standard. After a double bogey on the 1st, followed by bogeys on 2 and 3 I managed to recover and make 4 birdies on the next 15 holes to shoot 76 (+6). With Par and SSS the same at 70 I was more than happy to get round under handicap. The bar after was busy and welcoming, we ate in the Cast Iron Bar and Grill, which sits by the golf area adjacent to the spa facilities. The menu is varied and decent value. This would appeal to golfers direct from the course and guests alike. The Bar and Grill has been rolled out Marriott wide and compliments the style of this hotel. Breadsall Priory also offers a restaurant in the hotel which is more buffet style.